The Gregorian, or Western, calendar is the most widely used and recognized calendar system in the world--but that doesn't mean it's the only one in use. The concept of time in Bali, and the inherent importance of rites and festivals on daily life, combined to create a calendar system that is bewilderingly complex but intriguing in its history. For the first time, a book has been written which unravels the difficulty of the Balinese calendar system and makes it accessible to a general audience. 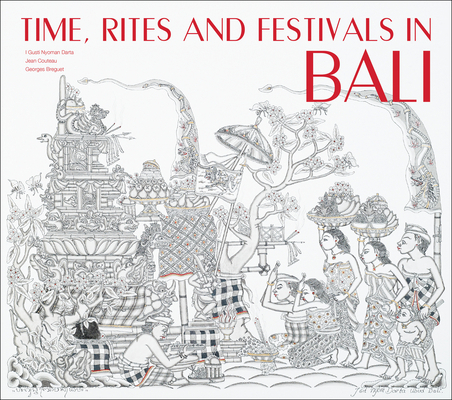 Time, Rites and Festivals in Bali, written by two recognized specialists of the culture, is a two part exploration of a breathtaking calendar system--and includes 62 specially commissioned drawings and a selection of photographs of rites along with wooden and painted calendars from museums around the world. From a lively introduction to the distinctly Balinese concepts of time, to an explanation of the two main calendars of Bali, to an in-depth discussion on the myth of Watugunung which is the basis for the origin of the main calendar system, Time, Rites and Festivals in Bali is a dynamic introduction to the spiritual and daily rituals that evolved at the core of this island nation.